In today’s release of Access Monitor, I’ve added two powerful new features for keeping your site accessible: the ability to test your posts before you publish them and the ability to prevent a post from being published if it doesn’t meet your required accessibility criteria. In the long run, my goal is to provide the ability for you to specify exactly which of Tenon’s tests are blockers for your site on a test-by-test basis; but this information isn’t currently available from the Tenon API (Application Programming Interface), so that remains a development for another day. Since the Tenon.io API sets a limit on the number of queries you can make, I want to make sure you know exactly what impact this will have on the number of queries you make. 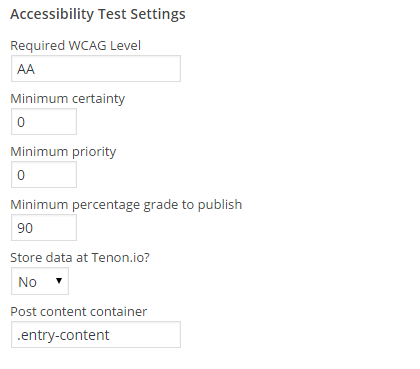 Using this feature means that a Tenon.io query will be made every time you attempt to publish a post that is not currently published and every time you click the button to make an Accessibility Check on your current document. It does *not* make a query to Tenon.io if you’re updating a previously published post. That’s awesome. How do I use it? Once you’ve updated Access Monitor to the latest release, navigate to Accessibility Reports > Add Report/Settings. Find the panel headed ‘Access Monitor Settings’ and check the box labeled “Prevent inaccessible posts from being published”. You can now choose which post types will be checked, what Web Content Accessibility Guidelines (WCAG (Web Content Accessibility Guidelines)) level you’re going to test up to, your certainty and priority expectations, and the minimum percentage grade allowable to publish a post. For a better understanding of what certainty and priority means, read Understanding request parameters at Tenon.io. You should also set the field for your post content container. By default, it’s set to .entry-content, which is a commonly used container for content in WordPress themes. However, it’s not at all universal; the name of the HTML (HyperText Markup Language) container is not part of the WordPress core, and it’s not at all standardized, so I have no way of knowing what your actual container is. If you use a blank value for the HTML container, Access Monitor will check the body element of your draft page. That’s not ideal, because it means that if you have any system-wide errors, those will be counted against every post you publish, as well. Setting the content area means that Access Monitor is only sending the published content of your post to Tenon for testing. There’s an extra option available for an email address, labeled “Email address to send requests for accessibility review”. That’s because I recognize that the people publishing your posts may not know what they need to do to resolve an error, or because an error may be coming from a plug-in or 3rd party resource that you can’t resolve easily. Administrators have the option to override the accessibility testing and publish a post regardless of it’s score; non-administrators can send an email requesting a manual review, so that person can either fix the problem or approve publishing the post without fixing it. That’s all you really need to know to use the new testing process in Access Monitor. Enjoy!